A gaming powerhouse in an elegant, slim design. Slim, elegant, and powerful, the GS65 Stealth Thin might be the best gaming laptop we've ever used. MSI's GS65 Stealth Thin might be the best gaming laptop ever made. It's certainly the gaming laptop I've always wanted. Powerful gaming innards, all-day battery life, and a great-looking screen all wrapped in a sleek package that's thin, light, quiet, and portable. The laptop easily earns a place in our best gaming laptops guide. I've tested a lot of gaming laptops, and they've changed considerably over the years. They almost follow a tick-tock cycle similar to Intel's processor development model, where each generation of laptops will increase in power but also bulk up in size, then shrink down considerably at a great sacrifice to game-playing ability. This cycle perpetuated for years, but we've never gotten anything close to the thinness and portability of productivity laptops like ultrabooks and the Mac design ethos while still being able to crush the latest games. Nvidia's Max-Q design philosophy finally hit that mark. By aiming precisely for the inflection point that maximizes both performance and efficiency, laptops with Max-Q GPUs are both "thin-and-light" as well as packing in gaming power. They're not quite as powerful as their non-Max-Q or notebook counterparts, never mind the full desktop cards, but the performance sacrifice is much less of a step down than in generations past. And since Nvidia's 10-series of GPUs are mighty powerful to begin with, the performance difference is even less of an issue. The GS65 isn't the first Max-Q laptop on the market—several have been around for more than a year—but most were still held back by some design flaw. The Asus ROG Zephyrus we reviewed last year, for example, utilizes a hinge opening and funky touchpad placement that does wonders for cooling but makes for awkward practical use. Then there's Gigabyte's Aero 15X, our favorite thin gaming laptop of last year, which ticked nearly all the boxes but lost marks for a stiff keyboard. The GS65, on the other hand, really feels like a refinement of the form—it's everything I hoped for when Max-Q was announced in the first place. If the GS65's Max-Q predecessors got all the internals right—top end processor, powerful but quiet gaming performance, etc.—the GS65 itself perfects the physical chassis. It has a sleek matte black aluminum body with gold accents that feels sturdy and luxe—and thankfully lacking in obnoxious gamer aesthetics. Best of all, the thin screen bezels allow for an overall chassis size that's about an inch smaller than most 15-inch laptops. That inch doesn't seem like much on paper, but it makes a world of difference when it comes to portability. I was blown away by the thin and light designs of the first batch of Max-Q laptops, but their 15-inch bodies meant they still didn't really fit into a normal backpack or messenger bag—not without the corners sticking out awkwardly. 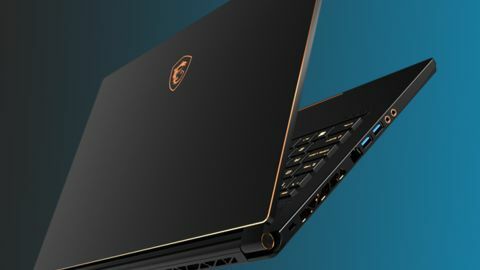 Gigabyte's Aero 15X impressed me last year with its thin bezel and smaller frame, and the GS65 here follows that same model. There are other nice details, too: a keyboard from SteelSeries that's solid and responsive (and RGB-lit, if you care about that sort of thing), a responsive touchpad, and a webcam that's placed at the top of the screen, thankfully avoiding the abysmally unflattering "nose-cam" found on most thin-bezeled laptops like the Dell XPS 13. It's also packing a 144Hz refresh rate on its 15.6-inch IPS display. The only gaming feature missing here is G-Sync, but that's a forgivable offense as the omission allows for both a lower price tag and battery life that legitimately lasts through a whole day of email, web browsing, and streaming video. Plus, the 144Hz refresh rate already goes a long way toward reducing perceivable tearing. Internally, the GS65 has Intel's latest Coffee Lake mobile processor, the six-core i7-8750H, paired with a GTX 1070 Max-Q GPU, which in gaming benchmarks performs about 10 percent lower than a "regular" GTX 1070. Luckily, the 1070 is an outstanding card for the latest games, so coming in a bit under it performance-wise still produces excellent performance in everything but the most demanding situations. This spec lets the GS65 maintain framerates above 60 fps in most of the latest games with settings maxed out. And by tweaking a few settings and disabling some of the more demanding, less visually-impactful options, you can easily push your framerates up to 100 fps and above, taking advantage of the system's 144Hz display. All in all, the GS65 Stealth Thin delivers everything I want in a gaming laptop. It has the convenience and portability of a productivity notebook—light and thin enough that I can toss it in my backpack, tote it to meetings, and comfortably use it on the couch—married with the internal guts of a gaming PC—powerful enough to play the latest games at high or max settings once the workday is over. If you're looking for a laptop that can do it all, this is the one to get.